Suicide survivor and musician Jennifer Sturgis spoke on campus about the suicide prevention group Foundation 45 and breaking the stigma of depression being an exclusively internal battle. 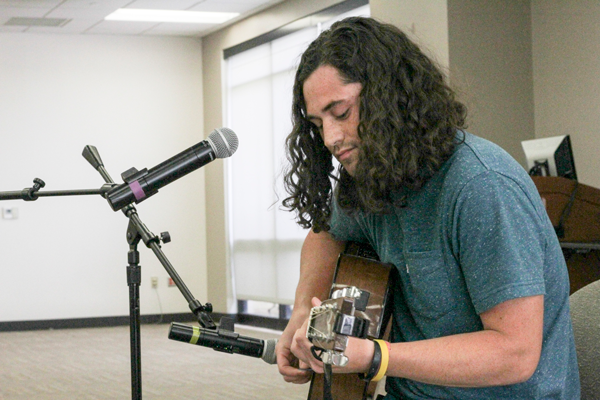 During the “Unplugged: Breaking Stigma Through Music” event on March 29, Sturgis talked about the resources and history behind the group. Member and artist Michael Posival also performed eight original songs, ranging from melodic and dark to bright and goofy. Foundation 45, a volunteer-run organization geared to help musicians and artists battle mental health issues, was founded by Anthony Delabano following the deaths of his Spector 45 bandmates Frankie Campagna and Adam Carter. Sturgis spoke on how Foundation 45 offers a different platform than other counseling services. They do not charge for their services and do not require those in need to set up appointments. They have three groups that meet weekly with licensed trained professionals to voice their issues. She said creating music can also give someone a voice they are not comfortable utilizing in a conversational setting. “[Music] is a place where I can share those emotions that otherwise would make me look crazy,” she said. Posival’s performance included a variety of original tunes with his acoustic guitar, a microphone and his lyric sheets. The songs discussed failing or failed relationships, alcoholic issues and succumbing to depression. Posival talked about how the lyrics drive the creative process for his music. Each song was met with resounding applause. Mike Middleton, a music major and saxophone player for the Eastfield Jazz Ensemble, shared how music gave him a voice when he didn’t have one. Middleton didn’t allow his impediment to control his life, getting the help he needed through speech therapy classes. He still keeps the saxophone around, however. Christopher Hogg, criminal justice major, said that music offers a connection to others who are struggling as a way to relay information to an audience that not only can hear the words but feel the emotions. Sturgis echoed the sentiment of not being alone during an emotional closing anecdote on dispelling that admittance and seeking help is for the weak.